On an unseasonably cool Friday afternoon, thousands of fans poured into AT&T Stadium to watch the fighters weigh-in for Saturday’s welterweight showdown between defending IBF beltholder Errol Spence and challenger Mikey Garcia. After the undercard fighters weighed in, the stars of the main event made their way to the stage. Garcia, No. 7 in The Ring’s Pound-for-Pound rankings, approached the stage to roaring cheers from the fans in attendance. Spence, The Ring’s No. 1-rated welterweight (No. 10 pound for pound), heard cheers as he walked up as well, but a loud chorus of boos drowned out his supporters. Garcia weighed in at 145½ pounds, a full 16 pounds heavier than he’s ever weighed for any fight in his 13-year professional career. 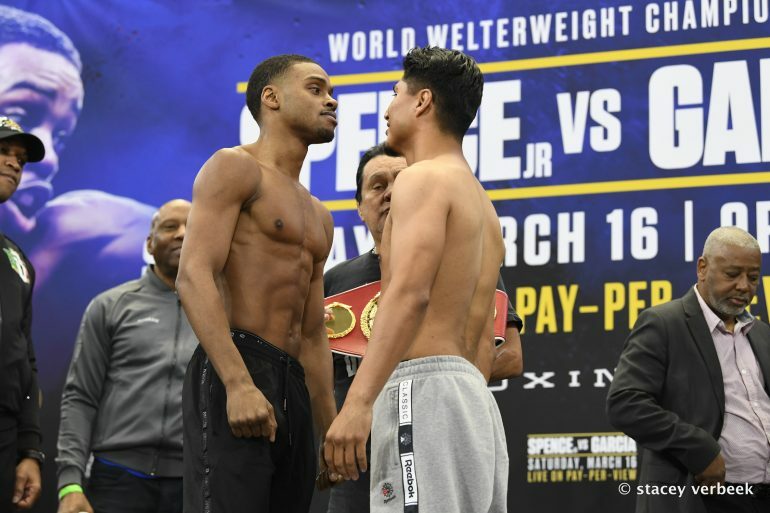 Spence came in at ripped and ready 146¼ pounds, his same weight when he came from behind to stop Kell Brook in Sheffield, England nearly two years ago. After stepping off the scales they engaged in an intense stare down. Spence shifted his weight back forth and hopped up and down while Mikey remained still. Both fighters began smiling at one another. About ten seconds later, Spence pounded his chest, broke the stare, and walked off. The hometown fighter noticed the lopsided fan support, but didn’t seem bothered by it at all. “The fans can’t fight for him,” he said. Spence is the hometown fighter. Born in Long Island, New York, he grew up in Desoto, Texas, a small Dallas suburb just south of town. Meanwhile Garcia grew up 1,500 miles away in California, but you wouldn’t have known it from the crowd reaction.. Make no mistake, AT&T Stadium will be a pro-Garcia house, tonight. The question remains how this may affect the judges and the fighters themselves as they square off. Another question is regarding weight. As mentioned above, Garcia is heavier than he has ever been in his professional career. At the same time, there was no struggle to make weight for him at all. Regardless of what takes place in the ring against Spence, Mikey Garcia is feeling the love in Texas. Once again, the Mexican-American fanbase has proven that they are the backbone of the sport in the United States. Win, lose or draw, tonight, they will be supporting their fighter. It remains to be seen if that will be enough against the IBF welterweight champ. Both men have the opportunity to prove they are better than good as they face the best of opponent of their careers.